If you have watched the movie ‘The Intern’, the probable thought that comes to your mind could be ‘Age No Bar to Learn’ – meaning, in spite being a septuagenarian, Ben Whittaker, a retired executive from a phone book company, played by the versatile Robert De Niro applies to a senior citizen intern program even after his retirement, in order to gain knowledge of the new-age-technology driven workforce. While the vision of a 7 decades old intern might look nothing but a good fodder for a comedy, this movie has a deep hidden meaning for the millennials than being just a slapstick comedy. Having said that, let us now come to the topic on how internship plays a major role for students in gaining a prior knowledge of an industry. Firstly, let us understand the meaning of internship. In simple terms, it is an opportunity that an organization provides to undergraduate/postgraduate students to gain work-based knowledge at a company for a span of one to six months. The students get hands-on experience to work in their desired field through internships. Likewise, they will get a firsthand knowledge of how their course or specialization applies to the real world. This inturn builds a priceless experience that makes them a much sought out candidate for jobs after graduation. This obviously helps the student get the right work experience, build a portfolio and establish a network of professional contacts which can help them after they graduate. Few companies even offer jobs to students who have excelled during their internship. For this, it is mandatory for the students to be proactive in their work, pay attention to the assignment given, be alert, listen, take criticism as well as volunteer for special projects. If a student aspires to get absorbed in the company or industry where he/she is interning, then perseverance, hard work, being reliable are few of the considerations that the company might look into. 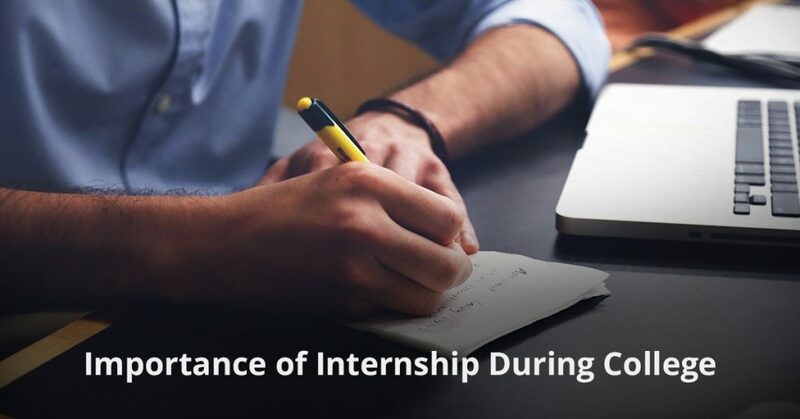 Finally, doing an internship is the most crucial thing that a student has to do during his/her tenure in the college, as it helps them to pick the right career. However, the vital point here is that doing internship not only enhances knowledge based on the course but also helps the student develop a right personality to face the industry once they graduate. Similarly, there are students who will still be perplexed regarding their choice of career as soon as they complete their internship. However, this can be resolved by approaching former interns or employees who are alums of the college, as they rightly fit into the shoes to resolve the confusion of the student. Why are short-term courses important? Have You Got Your Visume Ready? Previous story Why are short-term courses important? Should I Go for a Job or PG Course after my Graduation? Explore the Knowledge © 2019. All Rights Reserved.